The pastor of a megachurch in South Carolina, United States has defended buying a $200,000 Lamborghini luxury car as gift for his wife on their eighth wedding anniversary. 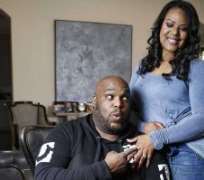 Pastor John Gray captured headlines over the weekend after an Instagram video taken of the moment he handed his wife the keys to the bow-wrapped “Lamborghini Urus” on Saturday went viral. He then addressed the matter in a video on Facebook Live on Thursday, in which he doubled down on his defence of the purchase and said “not a nickel, not a penny” of money from the church went to the gift. “First of all, it wasn't a pastor that bought the car. It was a husband that bought the car,” Gray said in the video. “What should concern people who are actually genuinely concerned is 'did this man use any money from the church to do this?' And the answer is no, absolutely not,” he continued. Osteen has also captured flak for his lifestyle, including living in a $10.5 million mansion in River Oaks, according to the Houston Chronicle. However, other social media users supported Gray and his wife, Aventer Gray, and questioned why people were critical of the purchase given the pastor also has other forms of income. Gray's wife also jumped to her husband's defense on Instagram, mentioning a number of different projects her husband is currently involved in – including a reality show on the Oprah Winfrey Network (OWN) and his various book deals. “I don't see anyone screaming about how basketball players drive what they do while you paying $$$ to see them play in arenas and on fields. We don't live for people! We live for God!” she said in the post.